OUR DEPTH OF UNDERSTANDING of how we fly has come from study of the mechanics of flight and the theory of airflow. This comprises the science of aerodynamics, which has its roots in the study of fluid mechanics and concerns all the forces acting on an airplane as a result of its motion through the air. When an airplane passes through the atmosphere, the air molecules behave like a fluid, flowing around the wings and fuselage, tending to stick to the surface and be dragged along behind, and, under certain conditions, being compressed. The pressure from this flow exerts the well-known lift and drag forces, and the less familiar stabilizing forces. Airflow shows an amazing variety of characteristics, which have been the subject of intensive theoretical analysis and study in wind tunnels. At slow speeds, the pressures an airplane generates as it moves through the air are small relative to the ambient atmospheric pressure. The balance between these two pressures establishes the boundaries of the aerodynamic flight corridor. The pressure produced by motion, called dynamic pressure, increases as the square of velocity. At Mach 1.2, the dynamic pressure is equal to the atmospheric pressure; at Mach 6, it is 25 times greater. This increase in dynamic pressure permits sustained flight at high altitude, where the atmospheric pressure is extremely low, provided the speed is high enough. Pressure forces are also affected by changes in airflow, from its elastic and viscous characteristics as it flows around an aircraft. Drastic changes in flow, as previously noted, are encountered in flight to high speeds. At 4000 mph, the airflow bears little resemblance to that at 400 mph. It will, in fact, have gone through four regions: subsonic, transonic, supersonic, and hypersonic. 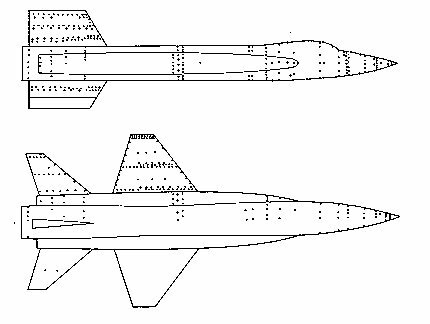 Mach 3.5 (above) and at Mach 6 (below). The major consequence of flight to high spced is the effect on airflow, because of the elasticity (compression and expansion) of air. At the slowest speeds, subsonic, the effects are not pronounced. As airflow velocities increase, the air becomes compressed, and pressure begins to pile up ahead of each part of the aircraft, until finally distinct pressure waves, or shock waves, form. The transonic airflow region is where shock waves first appear on an aircraft, though these shocks may be only local in nature. It is a region of mixed and erratic flow between subsonic and supersonic flow, which causes abrupt changes in lift and drag forces and airplane stability. As speed is further increased, local regions of subsonic flow disappear, and the flow is everywhere supersonic. The air has become further compressed. The shock waves are now distinct and trail aft in the form of a wedge, or cone, behind any object that interferes with the airstream. While a shock wave is normally less than .001-inch thick, the air undergoes large changes in pressure, density, and temperature across this minute boundary. These effects are far-reaching, even extending to the ground in the form of sonic booms. Aerodynamic theory has been developed that enables the characteristics of these shock waves to be precisely calculated. At higher supersonic speeds, the shock waves continue to increase in strength, bending back to form an acute angle with the aircraft surfaces. The equations of supersonic flow at this point no longer apply, and many interactions between shock waves and flow field are evidenced. One major effect is a loss of lifting effectiveness of the wings and tail surfaces, because the shock waves attenuate the aerodynamic forces. Of more significance, the friction of the air flowing along any surface raises air temperature to many times that of the surrounding atmosphere. Airflow is now in the hypersonic-flow region, and the science of thermodynamics is added to aerodynamics. Though not exactly defined, it is generally accepted as applying to speeds above about Mach 5. It is an area of multiple shock waves and interference effects. The difficulty for the aerodynamicist arises from trying to unterstand the effects of flow that is discontinuous at each shock wave. Each new geometric shape calls for reorganization of theory. By optimizing the shape, size, and relative locations of wing, tail, and fuselage, an airplane is made highly efficient for one flow region. But that particular configuration may have many adverse interference effects when airflow enters a new flight regime. Many compromises are necessary to achieve one configuration that is satisfactory from subsonic to hypersonic speeds. At the time the X-15 was designed, theory and empirical data (much of it from previous research airplanes) provided a good understanding of the mechanics of airflow for speeds to about Mach 3. But there were major gaps in aerodynamic knowledge above this speed. Some of these gaps were bridged by wind-tunnel tests of scale models of the X-15. However, although models of the X-15 were tested in many supersonic and hypersonic wind tunnels, they were of very small scale - 1/15 or 1/50 - and no verification had been made of the results from small-scale models for flight at hypersonic speeds. Moreover, wind tunnels approximate flow conditions rather than exactly duplicating them. Hence, a valuable part of the X-15 program would be to verify or modify the picture of hypersonic flow derived from these experimental techniques and from theoretical analyses. Over the years, various analytical techniques have been developed by which basic aerodynamic characteristics can be extracted from flight measurements of airplane response. 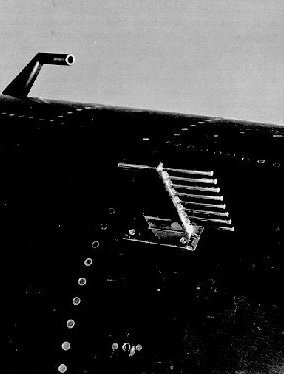 In general, it was found that these techniques could be extended to the X-15's ranges of speed and angle of attack. However, since most X-15 maneuvers are of a transient nature, the evaluation of dynamic motions was aided considerably by using the flight simulator to "match" the actual flight maneuvers. New techniques were required for the analysis of aerodynamic heating, however. Since the thermocouples provide only a measure of the response of the structure, techniques were developed on a digital computer to determine heat flow from the air into the structure. From these analyses, the details of hypersonic flow began to unfold. The results confirmed many of its nonlinear characteristics. The data also confirmed another peculiar trend of hypersonic flight: the reduced importance of the wings for lift. At Mach 6 and 25° angle of attack, the large fuselage and side fairings on the X-15 contribute 70 percent of the total lift, enough to permit reentry from an altitude of 250 000 feet with fuselage lift alone. As the shock waves trail aft from the fuselage nose, canopy, side fairings, wing leading edge, and other protubtrances, they interfere with the flow and cause further changes in flow angle and pressure forces. The wing and fuselage also induce a swirling motion in the airflow as it sweeps aft. Another significant change in flow occurs whenever the airplane pitches to a different angle of attack, for this alters the position of the shock waves sweeping aft. The consequences of these interactions become apparent when flow impinges on the tail surfaces, which provide the means of control as well as the major part of the stability. They may have a favorable effect on the balance between stability and control. In the case of pitch control, the X-15 can be maneuvered to higher angle of attack at Mach 6 than at Mach 3. At high angle of attack, the changes in flow angle influence the forces on the lower vertical tail, which becomes more effective. The upper vertical tail, on the other hand, comes into a region of lower pressure, and loses much of its effectiveness. 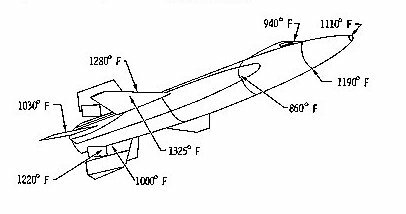 The lower vertical tail is able to offset this, though, and provides adequate directional stability to the highest angle of attack attainable - a lack of which proved so disastrous to the X-1A and X-2. In solving the directional-stability problem, a new difficulty manifested itself. The force on the lower vertical tail that stabilizes the airplane also tends to roll the plane whenever the counterbalancing force on the upper vertical tail is lacking. This type of motion has always plagued pilots, and aircraft designers try to obtain a balance between the rolling and yawing motions that the pilot must counteract. On conventional aircraft, which have virtually all the vertical tail above the fuselage, the roll is in a direction that eases the pilot's control problem. In the X-15 configuration, however, yawing produces an adverse rolling moment, which severely complicates the pilot's control task. This adverse roll was of great concern during reentry flight at high angle of.attack, and will be dealt with in more detail in a later section. It is sufficient to point out here that it was a major problem during the flight program. Fortunately, the lower half of the lower vertical tail is jettisoned prior to landing. Thus, a logical first approach to the stability problem was to remove this surface, thus reducing the magnitude of the adverse moment. This also reduced directional stability to marginal levels at certain other flight conditions, but a positive increment of stability was obtained by the use of the speed brakes. Various combinations of lower vertical tail and speed-brake position have enabled the X-15 to explore a wide range of aerodynamic characteristics; in effect, to simulate several different aircraft configurations. From this, designers have gained a clearer understanding of the delicate balance between stability and control for reentry at high angle of attack. The X-15 program has provided insight into theoretical methods used to calculate flow conditions and forces for hypersonic flight. Because of the complexities of hypersonic flow, the calculations are normally made for an isolated fuselage, wing, and tail, to which are added the incremental effects of mutual interference from shock waves and flow. Another assumption of the theories is that the airplane is treated as composed of straight surfaces, a cone-cylinder, for the fuselage and flat plates for the wings and tail. The theoretical methods also derive from assumptions of flow conditions at low angles of attack. Yet, these methods were successfully used to include the high-angle-of-attack flight of the X-15. In some cases, pressures on the wing and fuselage could be computed from simplified theories that ignore interference effects. But the key to closer agreement between theory and fact was through approximating as many of the interaction effects and nonlinearities as possible. One flaw in the theories was uncovered, however. In the region of the horizontal tail, the flow is too complex for available theories to predict the amount of control for maneuvering to high angles of attack. The X-15's aerodynamic measurements have verified the aerodynamic results of various wind-tunnel tests. Supersonic and hypersonic tunnels have rather small test sections, some only nine inches in diameter. This requires the use of very small models, a fact that increases uncertainty when the results are extrapolated to a full-scale airplane. However, measurements in six supersonic and hypersonic wind tunnels at NASA's Langley Research Center and Ames Research Center, and at the Massachusetts Institute of Technology and Jet Propulsion Laboratory, have shown remarkable agreement with flight results. Significantly, this was the first correlation with full-scale flight data. One area of discrepancy was found - in drag measurements. The tunnels provided accurate measurements of all the various components of drag except that produced by the blunt aft end of the airplane. This component was found to be 15 percent higher on the actual airplane - another area for further research. From this emerging profile of aerodynanic flow has come a clearer understanding of the peculiarities of the forces from subsonic to hypersonic speeds and to 25° angle of attack. In addition, it has helped pin down some flaws in aerodynamic theory and wind-tunnel testing. As valuable as this research has been, it is of a rather complementary nature. But in the field of aerodynamic heating, fundamental contributions to hypersonic aerodynamics have been made. This is, perhaps, a normal consequence, since it was an area with significant unknowns, not only during the feasibility studies and the design but until recent flights. Whereas consideration of aerodynamic forces was basically an extension of previous experience, aerodynamic heating of an airplane by the airflow was a completely new factor. Not the least of the difficulties has been to develop flight-test procedures and techniques to analyze structural heating from a high-temperature airflow. One part of the problem that was well understood from the beginning pertained to the heating of air particles as aircraft speeds increased. As the particles are pushed out of the path of the airplane, some are accelerated to the speed of the plane and undergo a huge change in kinetic energy. This energy is imparted to the molecules in the form of heat, which raises the air temperature an amount proportional to the square of the velocity. At Mach 6, this heat energy raises air temperature to 2500° F, although only within a thin layer of air near the leading edges of the aircraft's wing and tail surfaces, cockpit canopy, etc. The heat flow from the high-temperature air into the external skin of an airplane presents a complex problem, less well understood. Some early theoretical analysis dates from the 1900's, but, paradoxically, scientists at that time were concerned with the transmission of heat energy from the airplane to the atmosphere; they were trying to solve the problem of cooling aircraft engines. But the basic mechanism is identical for the X-15 - the transfer of heat energy between a fluid and the surface over which it passes. When the X-15 entered the picture, in the early 1950's, several theories of a semi-empirical type had been developed. The methods were based on assumed flow conditions with approximate solutions, and, although showing some agreement, they showed significant differences. Experimental results were meager, and one thorough series of tests, conducted to determine which theory was more accurate, showed trends that contradicted theoretical analysis. The basic problem is insufficient understanding of the flow properties in the layer of air near the skin. Heat flow is also a function of air pressure, and the regions of highest heating are found on frontal and lower surfaces that encounter the full impact force of airflow. An alleviating effect comes from flights to high-altitude, low-air-density conditions. In this region, even high air temperatures transfer little heat into the structure. Conversely, the highest structural temperatures encountered with the X-15 have been at Mach 5 and relatively low altitude. Only a small fraction of the total heat energy of the air is conducted into the aircraft structure. The predominant factors are the heat-conduction and -insulation characteristics of the hot boundary layer of air enveloping the aircraft. Where this layer of air flows in even streamlines along a surface, the heat transfer is small and predictable. But here the viscosity of air is the chief difficulty. One of air's most intransigent characteristics is that boundary-layer flow that starts out in smooth streamlines suddenly changes to a turbulent, eddying type of flow. This turbulent flow is not unusual. It is the normal condition of the flow over much of the X-15. But it introduces problems of major proportions. In spite of never-ending efforts to understand the mechanics of it, it remains a largely unpredictable phenomenon, even for subsonic flow. With the X-15 and succeeding airplanes, boundary-layer flow assumes major significance because of its effect on aerodynamic heating. Turbulent flow breaks up the insulating properties of airflow near the surface, and can increase the heat flow by a factor of six over non-turbulent, or laminar, flow. The irregular nature of the flow, moreover, makes calculation of the heat transfer across the boundary layer a highly speculative proposition. strains, accelerations, velocities, control positions, angles, and physiological data. experienced to date, and where they were recorded. Consequently, the research contribution of the X-15 data to aerodynamic heating has been through clearer understanding of heat transfer and local flow conditions across a turbulent boundary layer. This pioneering work showed initially that heat flow into the X-15 was 30-40 percent lower than predicted by available theories. This large discrepancy, while favorable to keeping structural temperatures low during flight to high speed, stimulated further analysis of the flow conditions. It appeared at first that the answer might lie in the difference between the type of shock wave assumed for the theories and the kind encountered in flight. Theory was based upon flow around pointed surfaces, with the shock wave attached to the surface and trailing aft in a straight line. 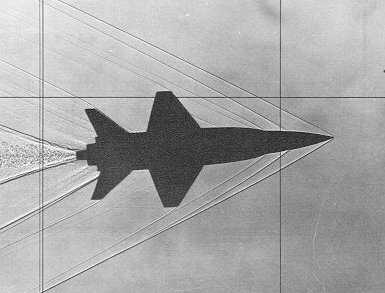 In actuality, the blunt leading-edge surfaces of the X-15 produce curved shock waves which remain positioned ahead of the leading points. These differences were disproven as a factor, however, through a series of research flights with a specially fabricated vertical tail with a sharp leading edge, which duplicated the theoretical model. No measurable difference from heat transfer with a blunt leading edge was detected. An exact understanding of the differences between theory and fact is still to be found. Accurate knowledge of heat flow into the X-15 structure has been obtained, however. From these data, empirical factors have been developed that enable designers to predict structural temperatures for proposed flight trajectories with good accuracy. They are confident that these techniques can be used to predict temperatures to Mach 10 or 12 and smooth the path for future hypersonic aircraft. The second part of the boundary-layer-flow problem, which concerns the point at which the flow becomes turbulent, remains as obscure as it was in 1954. Boundary-layer flow typically becomes turbulent whenever the viscosity forces binding the streamlines together are overcome by the pressure forces of the airflow along the surface. On the X-15 wing, this normally occurs anywhere from 4 to 12 inches aft of the leading edge. lt has not been possible to correlate the viscosity and pressure forces so as to provide a means for accurately predicting this phenomenon. 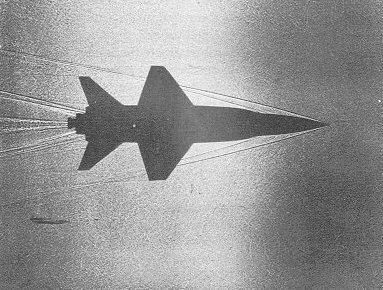 Lacking this knowledge, designers are forced to make conservative assumptions for the higher heating of turbulent flow, as in the case of the X-15. One of the many tools of the X-15's research is this multiple-probe pressure rake, mounted on the forward fuselage to measure boundary-layer airflow at hypersonic speeds. Below the rake is one of the 140 holes cut in the aircraft's skin to measure surface pressures. Above and behind the rake is a pressure probe, used only during landing, for the pilot's airspeed indicator. Thus, hypersonic flow has yet to reveal all its secrets. Enough is known, though, to provide a basic understanding of the pressures and heat input along the wing and the fuselage. In localized areas with large discontinuities interference effects, the flow is too complex to yield to a generalized analysis. For example, the wing-fuselage juncture, tail-fuselage juncture, and canopy obstruction create chaotic combinations of multiple shock waves and cross-flow conditions, especially at high angle of attack. Since these effects are synonymous with uneven pressure and heating, the loads and thermal stresses are equally obscure. Sometimes the magnitude of the unknowns was uncovered only when localized structural failures occurred, unexpectedly and dramatically upsettung the tempo of the flight program.